I am a Ricoh Imaging Dealer Other Dealer or Distributor? Registration on this page is intended only for direct end customers and is not applicable to Dealer or Distributor accounts. Any attempts to register this way will fail and/or be rejected by the site administrator. See our Dealer/Distributor FAQ for more details. MyRicoh is the place to order supplies and manage your Ricoh equipment. You must be a Ricoh customer to utilize this site. Enter your user name and password and we'll step you through the process. There are multiple errors on this page. You must enter a User Name. Must be in correct email format. Username already exists. You entered an invalid business email address. If you need assistance, click to chat with a customer service representative. The user is not a Ricoh Managed Services employee. You must enter a User Name. Must be in correct email format. Email / Username and Confirm Email / Username must match. You must register using your Ricoh USA email address. For security purposes, you must use a valid business email address. You must enter a password. Password must be at least 8 characters in length. Password must contain atleast one letter and one number. Password must not contain repeating characters. Password cannot contain the user name. You must enter a password. Password and Confirm Password must match. Great! You've entered your login credentials. 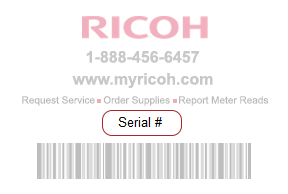 Now we'll need either a Ricoh account number, the serial number or the equipment ID from your machine or a project number or a registration code. Enter a serial number or equipment ID? How to find my Equipment ID? Equipment ID can be located on the front of your machine printed on the sticker that includes the ID number and a barcode. You must enter serial number or equipment ID. Serial number or equipment ID does not exist. Account owner for serial number is invalid. You must enter a Ricoh Account Number. This account number does not exist. Account number type is invalid. Registration code not found. Check your entry and try again, use Click to Chat or Click to Call or call 1-888-456-6457 for assistance. You must enter a registration code. If this is correct, continue to User Details. If this is not correct, check your entry and try again, use Click to Chat or Click to Call or call 1-888-456-6457 for assistance. Note: If you have additional pieces of equipment, they may be associated to your account after your registration is complete. You must enter a Ricoh Project Number. Project number was not found. Enter a new number or Click to Chat (top of page) to contact MyRicoh Help Desk to complete registration. The user is not a Ricoh Managed Services employee. This project includes more than one account. Cancel this registration and Click to Chat (top of page) to contact MyRicoh Help Desk to add this user. This project does not include any account. Cancel this registration and Click to Chat (top of page) to contact MyRicoh Help Desk. Great! Your account has been verified. Next let's get your contact information and select your responsibilities. You must enter a primary phone number. Phone number incomplete. Check your entry and try again. You must enter a valid phone number. You must select a phone number location. You must enter a secondary phone number. Phone number incomplete. You must enter an email address. Must be in correct email format. Will you need to submit Meter Reads? Primary - You are responsible for submitting meter reads by their due date. Alternate - Receives email for meter read due reminders. You must select a Meter Responsibility contact option. A primary meter contact must be designated for this equipment before an alternate meter contact can be added. Will you need to manage other users on MyRicoh? Note: Approval by Ricoh is required to be designated as a Fleet Administrator for your company. Fleet Administrators can add or remove users, edit user responsibilities, and manage the main account. Great! Let's review your entries. Check that the details you've given us are correct and then submit your registration to MyRicoh. Your password is not shown for your security. TIP Enrollments provide you with all the necessary rights and priviliges required for access to different parts of the system. For security measures, none of your entries will be saved. This device is part of your organization's fleet. Email your fleet administrator to request registration.You will receive a confirmation email when your registration is complete.